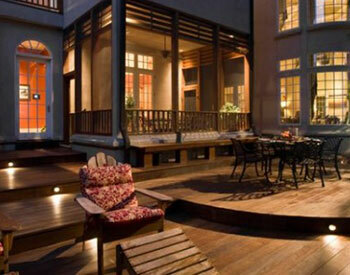 Outdoor deck lighting can transform even the smallest of decks and lanais into a world of beautiful illumination. A deck is a great place to relax or entertain. Professionally designed & installed outdoor lighting will allow you to safely extend your outdoor living spaces late into the evening. When people think of a decks they often are referring to the flat surface where we walk or sit. From a deck lighting design perspective there is much more to consider. The architectural style of your home, the surrounding landscape, the stairs, columns & railings of your deck are all features that should be considered when designing a beautiful lighting plan. Outdoor deck lighting systems by Coastal Outdoor Lighting incorporates a unique blend of lighting design & elements that comprehensively addresses your building’s architecture, property size, and planned activities. 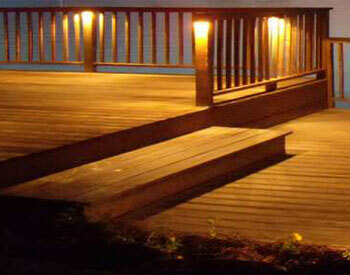 We only use quality deck lighting components manufactured by top rated companies. As a preferred vendor of these top rated companies our special pricing and support is passed on to you the property owners. Every employee drives a fully equipped, professionally marked company vehicle that is computer equipped and networked to your entire project’s design & history. When you call Coastal Outdoor Lighting you can be sure you are contacting a fully licensed and insured Florida deck lighting contractor. Every lighting design starts with a “Free” Onsite Consultation by one of our trained & certified deck lighting designed specialists. For the very best in deck lighting design & installation please complete our online request form or for the fastest response call us today @ (239) 491-6759.